John Migliori with a largemouth bass he caught Saturday on an Aquidneck Island pond. 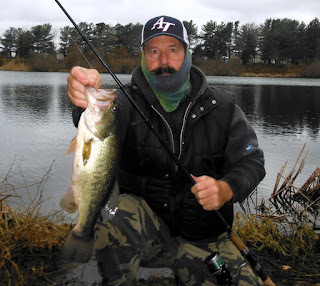 Freshwater fishing has been good when anglers have been able to fish with warmer weather and no ice on the edges of ponds. Last week the National Oceanic & Atmospheric Administration (NOAA) released their Fisheries Economics of the United States 2016 report. Both recreational and commercial fishing in the nation and in Rhode Island saw gains since the last 2015 Report. In 2016, commercial and recreational fisheries throughout the United States generated approximately 1.7 million jobs in the U.S. economy. In addition, commercial and recreational fishing together generated $212.2 billion in sales impacts, $64.2 billion in income impacts, and $99.5 billion in value-added impacts throughout the economy. In Massachsetts NOAA said recreational fishing had $1,070-billion in sales, $495-million in income, $716-million in value added to the economy, and the industry supports 9,957 jobs. But the commercial seafood industry is MA generates a greater value to the economy creating $2,318-billion in sales, $851-million in income, $1,161-billion in value added to the economy, and the industry supports 55,384 jobs without imports. In Rhode Island recreational fishing led the way with $412-million in sales, $176-million in income, $270-million in value added to the economy, and the industry supports 4,173 jobs. The commercial seafood industry is also very valuable in Rhode Island, creating $333-million in sales, $120-million in income, $169-million in value added to the economy, and the industry supports 5,193 jobs without imports. Last week Senators Edward J. Markey (D-MA), Elizabeth Warren (D-MA), Sheldon Whitehouse (D-RI), and Jack Reed (D-RI), sent a letter advocating for fishermen to the Bureau of Ocean Energy Management (BOEM). The letter urged the agency to continue to adopt policies for the offshore wind leasing and permitting process that bring fishermen and other marine stakeholders into the conversation early. The Senators said that early stakeholder involvement will help minimize spatial conflicts and reduce the risk of economic harm to the fishing industry. As wind developers lease areas in federal waters for the first time, the Senators contend that existing stakeholders must be thoroughly consulted both before and after leases are granted. In their letter, the Senators pointed to Rhode Island’s success fostering collaborative and meaningful engagement on the Block Island Wind Farm, proving that offshore wind and other marine industries can operate in harmony. The Senators note that while BOEM has tried to improve communication between the fishing industry and wind developers, many of their constituents consider the existing efforts to be ineffective. For a copy of the letter click HERE or visit https://www.markey.senate.gov/download/minimizing-conflicts-offshore-wind-and-fishing . This time of year… the quahog is still king in my house. Last Saturday I had the chance to dig a few quahogs in Narragansett Bay and host a linguini and quahog dinner for my brother-in-law’s sixtieth birthday. Quahog shell fishing can be cold this time of year, the water temperature was in the high 40 degree area. So anglers must layer up. My two pairs of wool socks, two pairs of pants and rubber waders with build-in boots kept my submerged body parts warm. I also wore thin cotton gloves under shoulder to fingertip large rubber gloves. It was great to get out and shellfish. Here’s my linguini with white quahog sauce recipe. Scrub littleneck quahog shells thoroughly and put them aside. Cook linguine while making recipe. Heat extra virgin olive oil in heavy pasta pan over medium heat, cook garlic in oil until golden brown (about one minute). Add and stir in 1/3 cup chopped parsley and all the unopened little necks, let simmer for two minutes. Add wine and let simmer for one minute. Add lemon and the meat of six to eight large quahogs cut up and cleaned (extra quahog meat is optional; if I catch them I put them in). Add red pepper to taste. Cook for eight to ten minutes or until all quahogs are open. Discard quahogs that are not open. Lower heat and put in one pound of cooked linguini and toss the entire mixture, put into large pasta bowl, then garnish with four pinches of fresh parsley. (This recipe is a variation of one I first saw in the May, 2002 issue of Bon Appétit magazine by Lori Demori). Party boats sailing for cod this time of year include the Frances Fleet at www.francesfleet.com , the Seven B’s at www.sevenbs.com, and the Island Current at www.islandcurrent.com .